Our 4 person yurts are very suitable for families. The large surface area provides plenty of opportunity for playing indoors, for example on rainy days. The 4 single beds are handmade by Piet using wood from the Corsican Pine from the Texel forest. 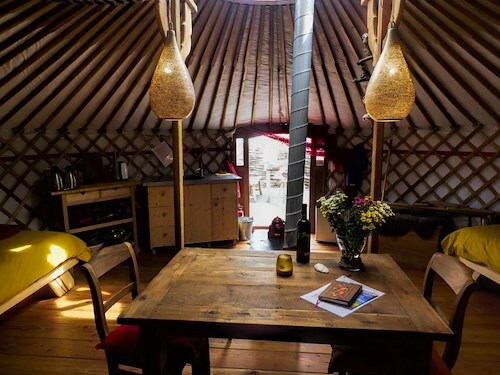 All yurts have a beautiful wooden floor, a kitchen block, wood burning stove and fridge. Hammock, two outdoor chairs and picnic table are provided. It is possible to hire a child’s field bed. The wood burning stove with oven keeps the yurt warm and makes ‘real’ cooking possible. Pleasant, cosy two person yurt with 2 single beds. It is possible to request a child’s camping bed. All yurts have a beautiful wooden floor, kitchen block, wood burning stove and fridge. Hammock, two outdoor chairs and picnic table are provided. The wood burning stove with oven keeps the yurt warm and makes ‘real’ cooking possible. This characteristic yurt is furnished with 6 single beds which are handmade by Piet using wood from the Corsican Pine from the Texel woods. All yurts have a beautiful wooden floor, kitchen unit, wood burning stove and fridge. Hammock, outdoor chairs (2) and picnic table are also provided. 4-person friends yurt Our 30m2 yurt is very suitable for groups, for example groups of friends. The 4 single beds are handmade by Piet using wood from the Corsican Pine from the Texel forest. All yurts have a beautiful wooden floor, kitchen block, wood burning stove and fridge. Hammock, outdoor chairs (2) and picnic table are provided. 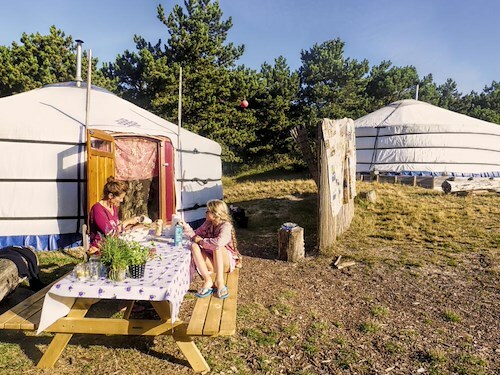 These yurts are situated on a raised wooden platform and have their own terrace. The small surface area and raised position make these yurts less suitable for young children. 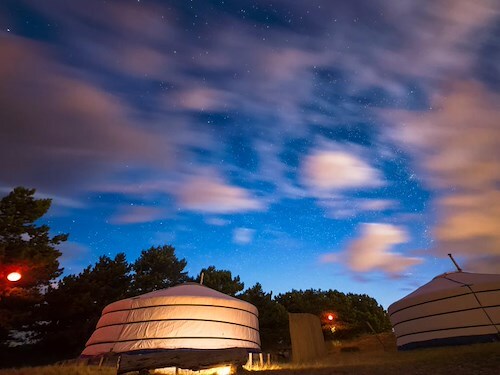 Our “hideaway” yurts stand together in a beautiful dune hollow on the edge of the pine forest. Romantically furnished and, naturally, with a double bed. 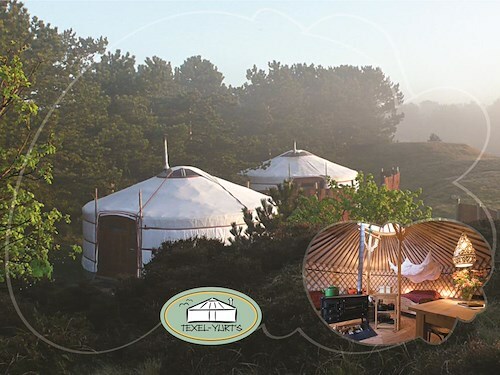 All ingredients are present in the yurt; a comfortable double bed, cosy sitting and dining area (in a circle), wood burning oven, where you can enjoy cooking together, and a fully equipped kitchen block. 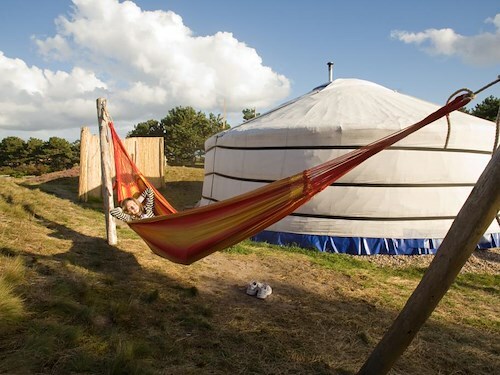 Outside of the yurt you will find the peace and quiet of nature around you in your own sheltered dune hollow, with picnic table, outdoor chairs and a hammock in which to laze around. Bringing your child with you? Then we can provide a camping bed with bed linen. This is the ultimate location for romantic nights, when you have something special to celebrate.